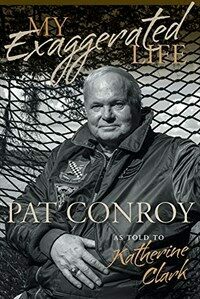 Pat Conroy's memoirs and autobiographical novels contain a great deal about his life, but there is much he hasn't revealed to readers--until now. My Exaggerated Life is the product of a special collaboration between this great American author and oral biographer Katherine Clark, who recorded two hundred hours of conversations with Conroy before he passed away in 2016. In the spring and summer of 2014, the two spoke for an hour or more on the phone every day. No subject was off limits, including aspects of his tumultuous life he had never before revealed. This oral biography presents Conroy the man, as if speaking in person, in the colloquial voice familiar to family and friends. This voice is quite different from the authorial style found in his books, which are famous for their lyricism and poetic descriptions. Here Conroy is blunt, plainspoken, and uncommonly candid. While his novels are known for their tragic elements, this volume is suffused with Conroy's sense of humor, which he credits with saving his life on several occasions. The story Conroy offers here is about surviving and overcoming the childhood abuse and trauma that marked his life. He is frank about his emotional damage--the depression, the alcoholism, the divorces, and, above all, the crippling lack of self-esteem and self-confidence. He also sheds light on the forces that saved his life from ruin. The act of writing compelled Conroy to confront the painful truths about his past, while years of therapy with a clinical psychologist helped him achieve a greater sense of self-awareness and understanding. As Conroy recounts his time in Atlanta, Rome, and San Francisco, along with his many years in Beaufort, South Carolina, he portrays a journey full of struggles and suffering that culminated ultimately in redemption and triumph. Although he gained worldwide recognition for his writing, Conroy believed his greatest achievement was in successfully carving out a life filled with family and friends, as well as love and happiness. In the end he arrived at himself and found it was a good place to be.